The Most Important Japanese Word You’ll Ever Learn! Prepare yourself for the most epic, of epic, the hero of all words in Japanese. Sake: It’s very important to know the word Sake (SA-KAY)…. (-_-)….. Yeah I know what you’re thinking. But just wait a minute and let me explain why I want you to know this word… and correctly. Why is this the most important Japanese word ever? It not only gets you the goods (alcohol), but the real reason I’m writing this is actually to bring you out of your complete Gai-Jin’ness (just created a new word), and make sure you don’t look like a dummy when you say this word in public. You can read a bit about sake here, but don’t believe everything wikipedia has to say. It’s not saki, that’s a no! Now, if for some reason some Japanese say saki, cool, cite me some references, but ever since learning Japanese (15 years ago), I’ve never heard it pronounced saki. It’s SA – KAY. Saki (SA – KEY) is not Sake (SA – KAY), it’s not even close, in fact it’s the difference between fermented liquids and a hot blooded Japanese female name Saki. Just because you might be a Western of some kind, doesn’t mean you got to act like one you know? I mean, c’mon. Let’s step up that Japanese and really show your friends, families and your best friends girlfriend’s mother what you really know about the Japanese language. If you can’t order a drink in Japan because you’re asking for a girl name Saki when you say it wrong, you’re not only going to look the fool, but everyone will be confused. Are you looking to hook up with a girl name Saki or you asking for some booze? Also here’s a super pro Japanese FYI: Sake (Sa-Kay) refers to simply alcohol, it doesn’t always refer to Japanese rice wine. If you want sake in Japan, you can ask for Nihonshu (Ni-Hone-Shoe). Then you’ll get some goodies that way. Perhaps if you’ve ever seen “Welcome to the NHK” you’ll know this by the sweet ‘innocent’ girl in that anime. Her name was Me-Saki (but I’ve heard chicks answer to Saki-san in Japan xD). But for now you’ve learned a very valuable lesson, and you’ll make it far… Very far in life in Japan by knowing the difference. 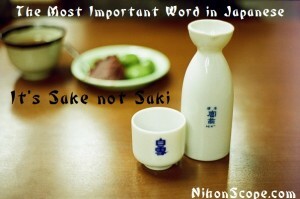 You can check out a in-depth informative history of sake piece here, you may also like snake sake (yeah… I’m serious) and just to make sure you continue down the right road with your Japanese abilities, you might want to check out my favorite free Japanese learning program online called: Nihongo Master. You can also check out an in-depth list of my favorite free Japanese learning resources here.